On 17th April 1975,Khmer Rouge forces under their leader Pol Pot take the capitol city Phnom Penh. Within 3 days their brutal genocide would begin. In 3 years, nearly 25% of the population have died through starvation, murder and disease. Nearly 40 years later and Cambodia is still trying to play catch up with the rest of the world. We were not sure what to find when we arrived here on 5th March, but we soon fell in love with the country and its people. We began our journey by passing through the Thai-Cambodian border at Poipet before having to share a taxi for the 45 minutes journey to Sisophon. 6 people in a 4 seater car! A: In Sisophon we helped celebrate the wedding of our friends, Charya and Michel. This was a 2 day traditional Khmer Wedding and we had lots of fun. You can see pictures if you look at here. B: From here we took the bus to Siem Reap – Home of the Temples of Angkor Wat. We spent 4 days exploring all the temples. From the smaller ones like Ta Som and Pre Rup to the larger and more popular Bayon, Angkor Wat and Ta Prohm. The temple ruins are one of my best memories. The level of detail and sheer number of them is enough to make Hampi (Karnatka,India) look ordinary by comparison. Sunrise at Angkor Wat was another special moment. G1: The long bus journey…. 9 hours!! We arrived in Phnom Penh wrecked. 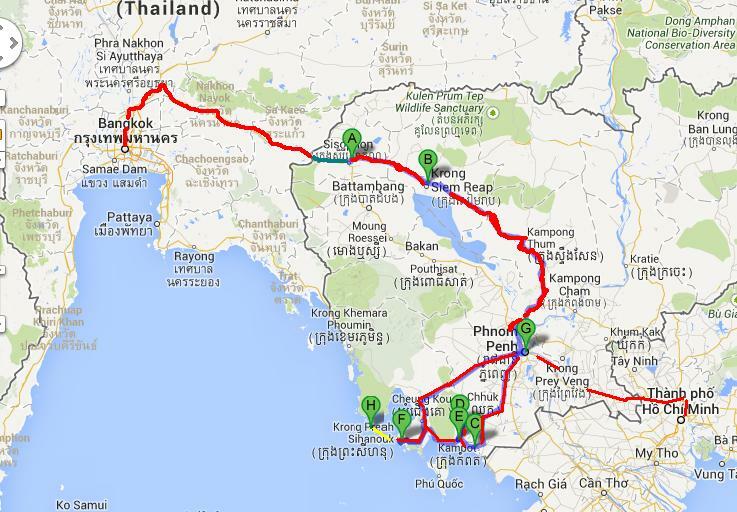 We decided to stop over (on the way to Kep) to break up the long journey. We would spend some more time here on the end leg of our Cambodia trip. On our only full day here we went to the Tuol Sleng Genocide Museum (Camp S-21) and the Killing Fields of Choung Ek. Both of these were harrowing places that describe in detail the brutality the Khmer Rouge had for its fellow Cambodians. The former weekend getaway for the French in Phnom Penh, its ruined villas are now being refurbished into guesthouses and hotels. We spent some lazy days here eating crab with Kampot Pepper sauce and walking along its beach. Close to Kep, this former port town is slowly re-awakening from it’s slumber. We celebrated St. Patrick’s Day here in the Oh Neil Bar before embarking on a river boat cruise for Sunset along its river. A mixture of new build hotels and roads and the old French Ghost Town. The old Bokor Grand Palace casino was the highlight of the tour. Some of the best beach bungalows ever! This was a great place for doing nothing with a huge 8km stretch of beach and tons of bars and restaurants. Saturday night’s action is centered on Otres Market for live music and street food stalls. It was here that we had our problems securing our Vietnamese Visa. Our secluded Island getaway. Managed by an Estonian called ‘Beast’ and completely isolated from Koh Rong Village this was great to discover. We also found out that Karen is better at darts than John! Back to the big city to explore in style. Taking it all in at the Riverfront and people watching from Charya and Michel’s balcony. But there were chores to do too. John had to visit the dentist and the laundry had started to pile up. We also needed to buy some supplies so headed to the Central Market. And in a moment of good timing, we managed to view some films for the Chaktomuk Shortfilm Fest 2014 – for Free!! We took the Phnom Penh to Ho Chi Minh City Bus corridor that included a short ferry ride over the Mekong River. We were very sad to leave Cambodia, but we have left some places untouched, so we can come back to see them. Kratie and it’s freshwater dolphins.